Home » Blog » Swollen Tonsils But No Pain, What Could Be the Cause? The back of the mouth and throat houses a compact and complex collection of essential equipment. Clustered closely together at the back of the throat are the uvula (soft hanging flap of skin), the adenoids and the tonsils. According to Patient Info, the tonsils work to help the body detect and deter infection. (1) The tonsils are easily visible masses of soft flesh that are located to either side of the uvula. As you might imagine, there are a great number of possible reasons why the tonsils might swell up as they do their work of fighting off infection. In this article, learn what it means when your tonsils swell without pain and what might be the cause of this symptom. In fact, one of the tonsils’ main jobs is to detect when germs are trying to pass and trap them. The tonsils are full of antibodies, immune system proteins designed to stop the infection before it starts. They are also full of pits called crypts which make perfect receptacles for trapping germs and allergens so the antibodies can dissolve them. » Tonsils can vary in size naturally, both in comparison with each other in a single pair of tonsils and also from one person to another person. » Even when two people’s tonsils are of comparable size, they can still look different when examined. This can be because of the thickness of the throat, the amount of soft tissue in the soft palate or the placement of the tonsils. A more forward placement can cause one tonsil, or one set of tonsils, to look bigger than another, even if they are actually the same size. » Finally, sometimes in a person one tonsil may be placed farther back in the throat tissue than the other, causing it to look like one tonsil is swollen and the other is not, even if they are both actually the same size and neither is swollen. It is critical to understand the natural variances in tonsil size and placement so you can be sure that what you are dealing with is a swollen tonsil. This is especially vital if you think the tonsil is swollen but you are not experiencing any other symptoms such as pain. » If you are having trouble swallowing. » If you can feel pressure on one or both sides of your throat. » If you look in your mouth and one or both tonsils look red or larger than usual. Once you have confirmed that one or both tonsils are swollen but you do not have pain, it is time to look more closely at the possible causes. 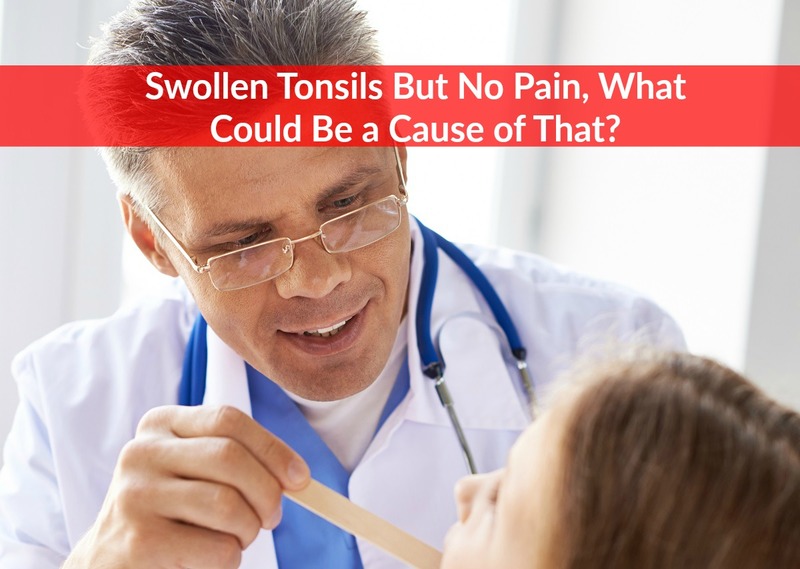 What Causes Swollen Tonsils Without Pain? A variety of underlying medical conditions can cause the tonsils to swell, even if there is no pain. » Exposure to Epstein-Barr (mononucleosis). Approximately 95 percent of people have been exposed to the Epstein-Barr virus at some point in their life. Once exposed, the person may or may not develop mononucleosis, which can also recur when the immune system becomes particularly compromised. » Exposure to Cytomegalovirus (CMV). the Cytomegalovirus is another less common cause of mononucleosis along with other symptoms. It also remains in the body system for life and symptoms can recur. » Exposure to STDs. Sexually transmitted diseases (STDs) such as chlamydia, syphilis and gonorrhea can cause tonsils to swell without any pain. » Eating spicy foods. Sometimes, simple exposure to very potent spices can temporarily cause the tonsils to swell up. » Food allergies. Similarly, if you eat a food that your body has a sensitivity or allergy to, your tonsils may swell up as a response. » Early stage tonsillitis. In the early stages of tonsillitis, tonsils may swell up but may not cause any pain. As well, if the body is successful in fighting off tonsillitis, swollen tonsils may be one of the only signs you get that an infection is present. What Are the Major Symptoms of Swollen Tonsils? Clearly, the major symptom patients most commonly report is the swelling in one or both tonsils. In lieu of pain or some other identifiable symptom, the swelling simply serves as a warning sign that the immune system is being attacked. » Difficulty breathing. If the tonsils begin to swell greatly, this can begin to block the airway and cause breathing difficulties. » Difficulty with swallowing. This can occur when tonsils swell to the extent that they begin to block the throat, which can also cause problems eating or drinking. » Pain in the head or ears. While the tonsils themselves may not be painful or tender, their enlarged size can cause headaches or ear pain. » Fever or chills. Another sign that infection may be present is when the body begins to produce fever or chills. » Discoloration or film on tonsils. If the tonsils appear covered with a film or have dots or spots on them, this can be another indication that the immune system is working hard to fend off disease. When the tonsils swell but do not cause pain and/or fever, this does not mean that there is nothing wrong. In fact, this is a clear sign that something is amiss, but in the absence of pain, it will just take a bit more digging to figure out what is causing the swelling. The first step is to keep a symptoms log and report symptoms to your physician. Then the physician can do a physical exam, listen to your lungs and heartbeat, palpate the tonsils and lymph glands and look in your throat and ears. » Blood tests. A complete blood count (CBC) and blood chemistry profile will highlight imbalances or abnormalities in the blood, including proteins or antibodies that may serve as markers for more serious diseases. » Throat swab. A throat swab can be used to diagnose bacterial or viral pathogens causing swollen tonsils. » Allergy testing. If blood tests and a throat swab come up negative, your doctor may order allergy testing to see if environmental or food allergies may be triggering the tonsils to swell as part of a greater immune system response. Once you have an accurate diagnosis, you can receive treatment to alleviate the swelling. » Rest and de-stress. Rest will help your body heal faster, as will easing any sources of stress. » Drink fluids. Flushing your system can help rid the body of germs, bacteria and toxins faster. Salt water or apple cider vinegar gargles can help neutralize these as well. » Breathe in steam or use a humidifier. Keeping your tonsils and throat tissues moist can ease swelling caused by dryness. If you have been struggling with swollen tonsils without pain or fever, you don’t have to worry alone. » Keep a symptoms log. » Schedule a medical appointment. » Get tested as needed to confirm your diagnosis. » Follow your doctor’s treatment recommendations.